Several years ago I order a few varieties of Bearded Iris that I selected specifically for their colors. As it turned out, a couple of them are Re-blooming Iris. Have they ever bloomed for a second time in the fall? No. Will they every re-bloom in the fall? No. BUT, that is because I am in zone 4! 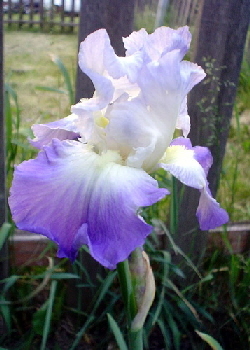 Most of the re-blooming Iris need a very long growing season to generate a second bloom. In 2012 spring arrived very very early so the iris bloomed very early, As it turned out, a warm fall went very very late so I was anxious to see if I would get a second bloom. Well, I came close. New flower stalks were just beginning to form when the cold weather hit, so still not a long enough warm season. There are many relatively new re-blooming plants that will reliably reward most gardeners with repeated blooming. Double Knock Out roses and Endless Summer Hydrangea re-bloom pretty reliably without special care. Removing faded blooms and fertilizing as directed will encourage the re-blooming. Many perennials re-bloom over a certain period without assistance, but typically do not bloom through the entire growing season. Some perennials, such as Salvia and Coreopsis need more encouragement to re-bloom reliably. Simply shearing the flower stalks back will do the trick. Annual flowers in general do the best job of continuously re-blooming with no help whatsoever. Perennials and shrubs that traditionally only bloom in spring now have some new hybrid varieties that will bloom again under the right conditions and with the right care. Re-blooming Iris have had a lot attention in the last few years. But there is no guarantee that they will re-bloom unless conditions are just right. In order to re-bloom they need very consistent weekly watering, plenty of sun, and just the right growing zone to get a long enough season to produce the second fall bloom. And if spring starts late or winter comes early, you probably won’t get the the second blooming. Most of the varieties will re-bloom only in zones 8 and 9, some in zone 7. There are a few that have been known to re-bloom in fall all the way north to zone 4. Midwest and cold climate gardeners should try ‘Again and Again’ (yellow), ‘Anxious’ (lilac), ‘Blue Moonlight’ (white), ‘Bonus Mama’ (cream), ‘Clarence’ (white/purple), ‘Eternal Waltz’ (lavender), ‘Harvest of Memories’ (yellow fragrant! ), ‘Immortaility’ (white), ‘Lemon Duet’ (white/lemon), ‘Rosalie Figge’ (violet), or ‘Viloet Music’ (blue violet fragrant!). Plant in full sun and as soon as the first blooms have finished, cut each flower stalk down to the foliage and keep up with the watering consistently to improve the chances of re-blooming. Unfortunately, it is very difficult to get the right information about these rebloomers from the growers or the merchants. The best resource I have ever found is Nola’s Iris Garden, where you will find some good information and also be able to order Iris. Each of the zone 4 rebloomers listed above is available from Nola’s Iris Garden. Reblooming Daylilies have been around for quite a while now, the most notable being ‘Stella De Oro’. ‘Stella De Oro’ is an ever-bloomer which means it will bloom over and over throughout the growing season. ‘Happy Returns’ and ‘Rosy Returns’ are also ever-blooming. These typically continue blooming without encouragement, deadheading the finished blooms is only necessary to freshen up the plant. There are also new hybrids that will re-bloom only once. The re-bloom may be early in the season, mid-season, or in fall. Re-blooming in zone 5 or colder is unlikely but in zone 6 re-blooming may occur. Zone 7 or warmer is generally required for Re-blooming Daylilies. Cold climate and Midwest gardeners should stick with the ‘Stella De Oro’ or try one of they other new ever-blooming hybrids. A couple of other re-bloomers for the north are ‘Jennifer Kayleen’ (Rosy Peach), ‘Boothbay Harbor Gold’ (golden yellow) and ‘My Complimentary’ (rose pink), all with somewhat smaller blooms but fairly reliable in colder climates (zone 4 or 5). These are not widely available so I can’t even suggest where to find them. I expect they may be stumbled across by pure luck or in small nurseries. I would suggest planting in full sun, regular deadheading, weekly watering especially in hot dry periods, and periodic fertilizing (or use a slow release granular in spring) to keep even the ever-blooming daylilies blooming. There does not seem to be good information available regarding “re-blooming zone” versus the hardiness zones for the re-blooming daylilies, so perhaps reliable local nurseries are the best source for your region. Re-blooming Lilac are ideal for Northern and Midwest gardens. Lilac prefer a cool climate and don’t do very well where summers are hot and muggy. ‘Bloomerang’ is a relatively new dwarf variety that not only re-blooms but should also do pretty well in slightly warmer climates. ‘Bloomerang’ produces the classic lavender blooms and fragrance in spring, takes a break in the heat of summer, and starts blooming again in the cool of autumn. The fall bloom will produce a flower panicle on each branch but the panicles are smaller than in spring. Shearing off spent blooms promptly will likely encourage a better fall blooming. To ensure a fall bloom period, give it what it needs most: well drained soil; supplement watering in hot dry periods; and periodic fertilizing or use a slow release granular in spring. Zones 3 through 6 are probably ideal growing zones for ‘Bloomerang’, but it should do pretty well in zone 7. In zone 7 you may want to plant ‘Bloomerang’ where it will get a bit of shade in the heat of the day.